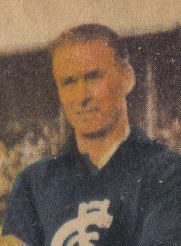 Cahill played 22 games for Carlton commencing in Season 1948, kicking 2 goals. He was recruited from Footscray. Much like fellow Blue Jimmy Goonan some 20 years earlier, Cahill would play 19 of those games in guernsey #3, 4 more in a different jumper (in Cahill's case, guernsey #8), making a grand total of 23 games for the Navy Blues. Cahill played 21 games and booted 18 goals at the Western Oval 1938-45 and played his pre-VFL games at Spotswood and Emerald. Cahill passed away on the 10th June, 1982 aged 60. The Horsham Times 29 December 1950, reported that Frank Cahill was appointed secretary of the Dimboola Football Club. He was last year's coach. Contributors to this page: Bombasheldon , molsey , blueycarlton , WillowBlue , tmd1 , p(12)terg , dgreen2 , keogh , true_blue24 and admin . Page last modified on Tuesday 04 of June, 2013 20:58:48 AEST by Bombasheldon. 1985 Rd 14 - Wayne Blackwell spoils Roy Ramsay.